Observation - Birch Woodwart - UK and Ireland. Description: Small, black, hard, bramble-like growths on dead Birch logs with bark. 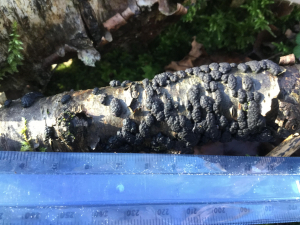 Small, black, hard, bramble-like growths on dead Birch logs with bark.